SHAR is continuing to celebrate Women's History Month this week by honoring Rebecca Clarke, a virtuoso and composer with a complicated past . Having faced many internal and external obstacles in her efforts to be recognized as a composer, the strides she made laid the groundwork for generations of women to be heard. Great artists often have complicated, and occasionally tumultuous, pasts. Rebecca Clarke is no exception. She was one of four children born to Joseph and Agnes Clarke. Her father, an American architect, was not a kind man. “We were all of us whipped, sometimes really painfully,” Rebecca Clarke once wrote, referring to her father’s mistreatment of his children. He was a very controlling and cruel man. He was an avid hunter, but when he got bored of shooting at animals, he would aim at his children and shoot to frighten them. He verbally abused his family, as well, by regularly berating them for any perceived fault. One good influence her father had on her was her love of music. Clarke described her father as a “an ardent amateur cellist”, and he pressed his family to be musical so they could play chamber music together. Mrs. Clarke was a “serviceable” pianist, while Rebecca and her younger brother, Hans, took up violin as children. The family often made music together and music became a very emotional experience for Rebecca. Can you imagine the conflicting feelings that surfaced while playing music that she love with a person who treated her so poorly? Throughout her schooling, her home life remained toxic until she was banished from the house in 1910 for shaming her father for having an affair. After leaving, she continued to channel her energy into her compositions. She also used this new freedom as opportunity to move to America and continue pursuing her performance career. 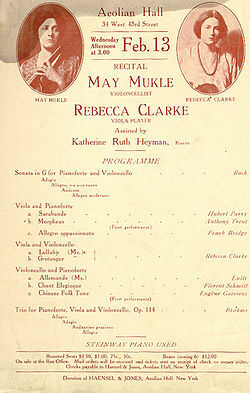 In a joint recital with cellist May Mukle in New York City, Clarke premiered two of her compositions. While one short chamber piece, Morpheus, was presented under the pen name Anthony Trent, she presented a viola and cello duet under her own name. She worried that having her name repeated so many times on the program would be “silly”. The piece by Trent was praised by critics, but there was little mention of Clarke’s duo. While some could argue that the piece penned by Trent was just better, it’s very possible that it only received more acclaim because a man’s name was tied to it. The music community continued to feed into Clarke’s self-doubt as she progressed in her career. 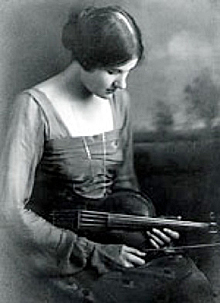 She entered one of her most notable compositions, a sonata for viola and piano, into the Berkshire Musical Festival competition at the urging of her friend, Elizabeth Sprague Coolidge, who also happened to be the sponsor of the competition. Her sonata was tied for first place alongside a piece by Ernest Bloch. To avoid talk of favoritism, since Clarke knew the patroness Coolidge personally, Block was declared the official winner, though some say Clarke’s sonata was favored more among the judges. After it was revealed that the admired sonata was composed by Rebecca Clarke, reporters began to speculate that she hadn’t actually written the piece. Clarke commented on this,“The rumour went around, I hear, that I hadn’t written the stuff myself, that somebody had done it for me. And I even got one or two little bits of press clippings saying that it was impossible, that I couldn’t have written it myself. And the funniest of all was that I had a clipping once which said that I didn't exist, there wasn't any such person as Rebecca Clarke, that it was a pseudonym for Ernest Bloch.” That a woman might have composed something so complex and beautiful was inconceivable for the public at the time. She moved back to London in 1924. The Women’s Suffrage movement and World War I had come and gone, and while women’s rights had made great strides in England at that time, the dust had begun to settle. Society began to settle back into more traditional roles, and this was made apparent in the critical reception of a concert Clarke put on in 1925. She had many of her original pieces performed at this event, and critics were not shy about calling to attention her womanhood and its perceived effect on her composition style. “How remarkable,” read a review in the London Star, “is it that our women composers are so much more virile in style than some of our young men. 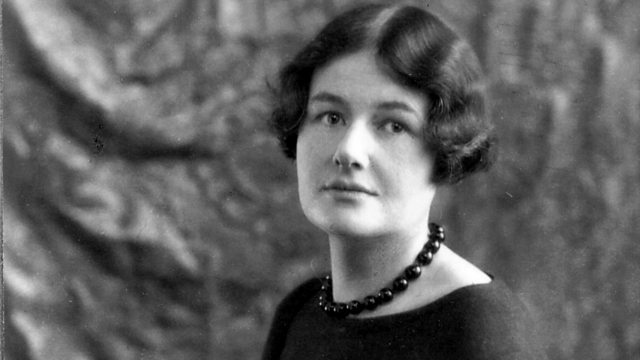 Miss Rebecca Clarke has a strong right arm (We speak figuratively, of course).” The Cardiff Western Mail wrote, "Rebecca Clarke...is, as all women composers, largely reflective of preceding masculine creations." While comments like these are not wholly negative, the condescension and generalization exhibited does nothing but undermine the art women create. In spite of the continued scrutiny, Clarke continued to perform regularly and write on and off for a few decades before stopping entirely in the 1940s. Rebecca Clarke undoubtedly achieved great success as a virtuoso, but her success as a composer was less defined. Her creativity was astounding, and she spoke about composition fondly, saying she was “flooded with a wonderful feeling of potential power” when she wrote. While her composition output varied across her lifetime, she wrote over 100 pieces, even though only 33 are published today. How could this be? Many believe that the same trauma from her childhood that gave her fodder with which to compose also left her with little confidence in her writing. This lack of confidence was no doubt made worse by the public reception she often received. Many speculate that, throughout her career, Rebecca Clarke’s identity as a composer was at odds with her identity as a woman. This, however, does not mean that she was weak. She lived in a society that forced her to second guess her choices and prove her femininity time and time again. But her creative spirit still lives today in the pieces she wrote. In recent years, researcher’s interest in female composers has resurfaced. In 2002, the Rebecca Clarke Society was founded to help promote and encourage with performance and knowledge of Rebecca Clarke’s music. While she faced many internal and external obstacles in her efforts to be recognized as a composer, the strides she made laid the groundwork for generations of women to be heard. Make sure to subscribe to our blog and follow us on social media for more about Rebecca Clarke and other notable female composers throughout the month of March!